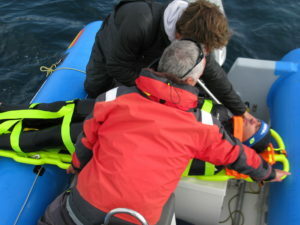 Medical incidents onboard thankfully do not occur too often and the medical kit and equipment as one part of the safety gear onboard a vessel is normally designated for emergency use only. Accidents and incidents do however happen and having regular updated training and reviews of medical response protocols is equally as important as conducting MOB and fire drills. When at sea and offshore the level of response is raised to another level without having near or immediate access to professional medical personnel and facilities. First response reaction and administration of preliminary first aid is key. As with all things, the less a skill is utilised or required the easier it is to forget, so it’s a case of being regularly refreshed or practiced to be prepared. One can never be prepared enough. Types of incidents that we at MSOS have dealt in the last year range from minor cuts and wounds to anaphylaxis, tetanus infection, appendicitis, viral infection and illness to major trauma with some cases requiring evacuation and repatriation from extremely remote locations. Key to a comprehensive preparedness is having access to 24/7 telemedical support to Doctors. We encourage calls to our service early and often even for non-emergency situations. Even a small cut in a tropical location not treated properly can develop into a major problem. For this reason, we lay heavy emphasis on the importance of regular training and practice, not only classroom-based MCA training to meet seafarer requirements but onboard training with drills specific to the vessel and practice with the various kits and equipment. Each vessel is different and so some techniques that may work on one vessel may not on another. We recently conducted a Training Day for the Spanish Olympic sailing instructor team. 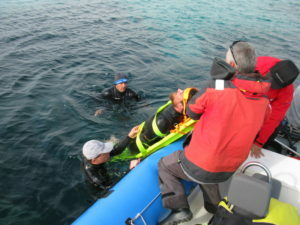 This included a rundown on first aid and trauma procedures, cpr and resuscitation review in the classroom and an outdoor session of in-water rescue techniques using various stretcher equipment.